Enjoy 99.9% pure water for a fraction of the cost of bottled water right in your home. It's perfect for drinking, cooking and even your pets! Our commercial water distillers are built to provide clean water for a variety of uses from offices, apartments to medical and dental applications. Join a passionate team of people who are dedicated to helping people learn about and enjoy the benefits of distilled water. The world's largest water purification system is all around us, although we may never really think about it. Look at the clouds, feel the rain and know that this is all part of the Hydorologic Cycle. This process can best be seen on an island in the middle of the ocean. Take Guam, in the Western Pacific, for example. Guam is surrounded by hundreds of miles of salty sea-water. This sea water cannot be consumed due to its very high levels of toxins (about 35,000 parts per million of dissolved solids). When it rains in Guam the rainwater is zero parts per million of dissolved solids. When the sun beats on the ocean it causes H2O is change to a vapor and evaporate. When H2O in the vapor phase leaves the liquid phase it leaves the contaminants behind. When the conditions are right the clouds release the H2O as rain and, absent air pollution, the rain is pure water. This 3-step process is called the Hydrological Cycle and it has been operating for time immemorial. This is a natural process operating according to the laws of physics and it provides water of amazingly high quality in a continuous cycle. There are a lot of myths surrounding distilled water, but the reality is that there are many benefits to drinking distilled water. One of the main benefits is that the water produced is 99.9% pure, which means it is toxin free. Did you know that most tap water contains perhaps 15 - 40+ known contaminants that are still present in the water as it enters your home? If you want to drink pure water, distillation is the answer. Read more about the benefits of distilled water. Our flagship brand, Pure Water has been in existence for nearly half a century. We started in Nebraska when the brand founder developed and patented the first stainless steel household water distiller. Today the Pure Water brand ranges from a small countertop water distillers to large energy-efficient commercial systems. 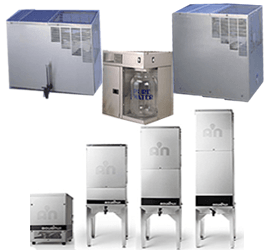 We also handle custom jobs and have networked supplied 300 unit apartment complexes with pure distilled water delivered to the sink and refrigerator in every single apartment. Over the years we have continually improved the designs of the units. Today virtually all Pure Water units have been redesigned to eliminate the very hot surface still common in some distillers on the market today. The larger systems are generally sold through local dealers, who can make sure the installation is done correctly and who can provide service. Made by the world leader in the design and manufacture of water distillation systems. We started out as number 1, and we’re still number 1! A plentiful supply of purified water. Pure Water Distillation Systems provide enough water for all of your family’s CONSUMABLE needs. You wouldn't think of making soups, coffee, or pasta in bottled water, but you should! Whatever goes into your body has a direct affect your family’s health. ABSOLUTE convenience! Distilled water at your fingertips. No heavy bottles to lift or carry. No waiting for deliverymen! Take your own bottled water to work, the health club, or on family trips. Consistent purity year after year. Our units provide consistently pure water glass after glass, week after week, and year after year. Other treatment methods can’t say that. A HUGE number of satisfied customers. Hundred’s of thousands of customers, hundreds of US Embassy’s, and countless doctors and nutritionist’s can’t be wrong. Made in the USA. All of our products are made at our headquarters in Lincoln, Nebraska by the best workers in the world. Superior workmanship. We are still the industry leader for one reason, we love what we do, and that shows through in our excellent workmanship. Our systems are built to last for more than 15 years. Superior Design. We focus our thirty years of practical experience in designing attractive, extremely durable, and easy to use distillers. Celebrating our 30th YEAR Anniversary. We have the experience, know-how and credibility to offer the best products and service in the industry. Excellent customer service. We want you to be happy with the company and our product for at least the next 15 years. All Pure Water systems use distillation. Distillation is the single-most effective water treatment method! It is the only process that boils the water, and uses the pure steam. Made with heavy-gauge Stainless steel. Our units are built to last. A health change your family will stick with. Health clubs, exercise equipment, and diets are difficult changes to get your family to stick with because they all require a change in your lifestyle. With a Pure Water Distiller you are a making a positive change, without making a change in your lifestyle. Less expensive than bottled water. 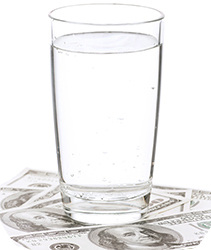 Since your own bottled water is so inexpensive, you won’t have to ration your purified water like you did with your bottled water. That means that you should feel comfortable using it for all of your family’s consumable needs. Make your own bottled water. Take your own bottled water to the club, work or on a trip. A wise investment. After years of buying bottled water, what do you have to show for it? Nothing. When you own a distiller, your investment continues to pay for itself many times over. Environmentally friendly. Do you know how many bottles of water you can throw away in a month? With a Pure Water distiller there is no more throw-aways! Simple operation & maintenance. Very easy to operate and maintain, so you can spend more time doing what you want to do. The highest quality components. The best equipment needs the best components. Great Taste. Your family will love the clean, refreshing taste of distilled water, and because of the taste they will most likely drink more water! That’s what you want isn’t it? Our distillation systems don’t waste water. All Pure Water distillation systems are AIR-COOLED, which means that you won’t waste a tremendous amount of cooling water down the drain. Be the first person on your block to have a Pure Water Distiller. Someday they will have one too, but you’ll reap the benefits now. Pure Water Brandwas the first distillation company. Founded in 1968, Pure Water Brand was the first company to specialize in high-quality home distillation systems for drinking water. Experts recommend distilled water for all your consumable needs. Thousands of doctors, nutritionists, chiropractors, athletes and moms recommend distilled water. Prepare yourself for emergency situations. In emergency situations safe drinking water can be scarce. Pure distilled water can be stored for emergencies such as hurricanes, tornadoes, droughts, power outages and eartquakes. Duplicates Mother Nature’s method. 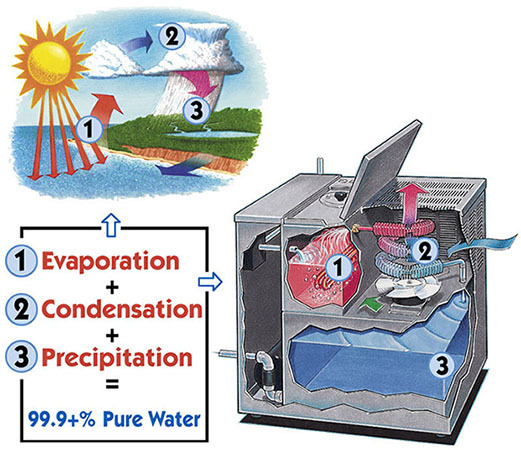 Mother Nature’s primary purification method is called the hydrologic cycle, in which water evaporates, condenses into clouds, then falls to the earth as pure H2O! Distillation evaporates the water, condenses it, and gets droplets of pure H2O. The FBI is joining a criminal investigation into why Flint residents have been exposed to lead in their water. Ensminger’ 6-year-old daughter, Janey, died from Leukemia in the fall of 1985 after being exposed to the toxic water. They're bringing in bottled water for students to drink but other public water systems, and many private wells, could also be at risk for contamination. Some Flint residents are complaining that the city's water is causing skin problems for some children. For years residents didn't know why so many people were becoming sick. It wasn't until years later that the cause became known. For nearly 20 years, New Englanders drank and bathed in water without knowing it was laced with a neurotoxin. Massive algal blooms like the one that has turned the waters of Lake Erie florescent green and contaminated the drinking water of Toledo, Ohio. California's drought has put 10 communities at acute risk of running out of drinking water in 60 days, and worsened numerous other health and safety problems.